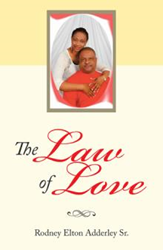 Driven by the desire to inspire those who are hurting with sickness and encourage married people to “restore” their love, Rodney Elton Adderley Sr. penned “The Law of Love” (published by WestBow Press). Readers may visit https://www.westbowpress.com/Bookstore/BookDetail.aspx?BookId=SKU-001152584 to purchase and know more about the book. “The Law of Love” shows the readers how love can restore someone to happiness and provide them with protection and healing from the wounds, hurts and pains in life. The inspirational book upholds the notion that “God is love” and he has made it possible for love to be found everywhere in people’s lives, if only they seek it out and cultivate a healthy love life of faith, hope and joy. Drawing inspiration from life experiences and personal pain, Adderley shares in the book how the love of God healed him and hopes to provide encouragement to others who are seeking for love in their lives. “The Law of Love can help you seek out this love, and it will reveal how you can cope, manage, and deal with the obstacles and challenges along life’s journey,” the author concludes. By Rodney Elton Adderley Sr.
Rodney Elton Adderley Sr. was born on February 28, 1969 in Long Island, Bahamas. He served in The Royal Bahamas Police Force then became the founder of We Buy – U Sell Group Co. Ltd. Adderley has embraced the love of God, and his life has been transformed through Christ. He is married to his wife, Patrice, and together they have five children: Charnice, Belinda, Rodney Jr., Ophrah and Sunae.